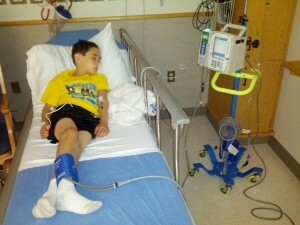 Yesterday, Domenic has his infusion of Remicade. For those that don’t know, Domenic gets a monthly infusion for his Crohns Disease. We’ve been doing this for almost three years now. Remicade has made a huge difference in Domenic’s life. It has greatly improved his quality of life and, along with another medication called Methotrexate, has allowed him to be just like any other eight year old boy. Because we’ve been doing this every month for roughly three years, I’ve become a little numb to the entire process. You get use to things as time goes on.. Yesterday, as Dom was having the procedure done I just happened to glance over at him, while he was sleeping, and noticed all the tubes, machines, and wires connected to him. It gave me pause for a minute. It made me think.. This is what it takes for my son to be an 8 year old boy.. All of these wires, tubes, and extremely powerful / dangerous medications connected to him. Don’t get me wrong.. I’m very grateful that we have this process and we are able to do it. But at the same time, it also breaks my heart. NO child should have to go through this! If you would like to see more of the process that Domenic goes through when getting his infusion of Remicade, you can check out my timeline on Twitter. You are such a good daddy! Dominic is one lucky boy to have you there to advocate for him and his peers. On occasion, I feel sorry for myself as an adult, for being on Remicade for 10+ years. Sometimes I take my results for granted…that is, until I see a youngster join me in the infusion room where there is only room enough for two. It is then, I get angry and often must turn my head and cry. It just is not fair. Thank you Hollie for the kind words and thoughts.